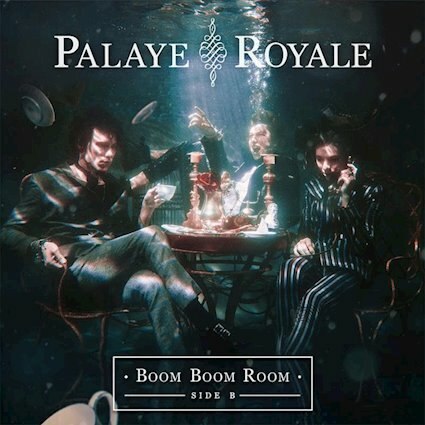 After their first release of the album (Boom Boom Boom Side A), Side B definitely seems to pick up where A left off with the raspy vocals, catchy lyrics and is definitely a very decent follow-up to Side A! Opener ‘Death Dance‘ is infectious enough to have you singing along to it’s hooks. What you have on this album is some bold, gritty, indie rock like it’s the lovechild of The Cribs and Artic Monkeys. One thing I will say is that the vocals on this are very distinctive, you could probably tell who this band are by hearing them alone! Follow up track to opener is ‘Teenage Doors Of Heartbreak‘ and again follows this format of catchy old-school sounding indie rock. Other highlights of this album where this band are at their best are ‘You’ll Be Fine’, ‘Mrs Infamous’ and ‘Hospital Beds‘. Like with Good Charlotte‘s new album, this album also feels a little brief at 8 tracks long, that by the time the final full length track ‘Love The Void’ finishes and you enter the final track ‘The Boom‘ which is an interlude, maybe you’re feeling this is a little too brief, maybe you’re feeling it was too short and sweet, but one thing is for certain, you are definitely left wanting more!